The triple jump, which probably puts more stress on an athlete's body than any other field event, comprises of 4 phases: approach phase, hop phase, step phase and the jump phase. Start with the basic movements by having your athletes Hop, Step and then Jump from a standing start. The take-off foot should be the athlete's strongest leg, as it will be used in the Hop and the Jump phases. Consecutive bounds duplicate the step and jump actions and the athlete should do these with a double-arm action and land full footed. Combine the three phases of the jump by starting with Hop and Step combinations on grass and then add the Jump phase. Emphasize carrying the momentum from one phase to the next with an even rhythm for each phase. 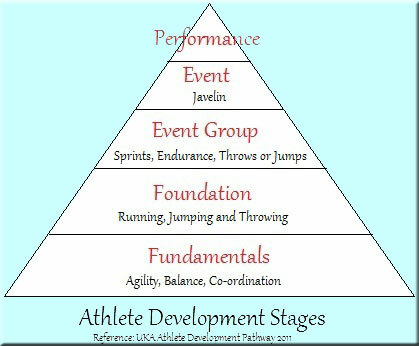 Once the jump phases have been put together, slowly add steps to the run-up in accordance with the athlete's ability to control speed. As in the long jump, the athlete's eyes should be focused beyond the pit for the entire jump. The approach run for the Triple Jump is similar to that of the Long Jump and the objective is to create the greatest amount of speed that can be controlled throughout the triple jump hop, step and jump phases. The athlete's strength and technique will determine the optimal run-up distance and speed. The use of a single or a double arm action at take-off depends on the athlete's preference - the double arm action provides more power. Aston Moore (BAF Junior event Coach, Triple Jump 1992) considers the appropriate distribution of the triple jump distance is as follows - Hop 35%, Step 30% and Jump 35%. Watch Jonathan Edwards in 1995 set a new world record of 18.16 metres for the triple jump and then in the next jump set a new world record, which still stands today, of 18.29 metres (Commentary in German). Jonathan has triple jumped 18.43 metres but is not in the record book because of a strong tailwind. Ukraine's Inessa Kravets is the current women's world record holder with a jump of 15.50 metres in 1995.